This step by step guide will help you plan and construct your pergola and leave room you to add your individual style. 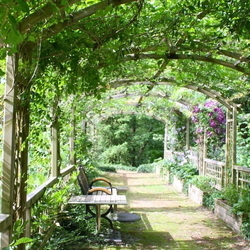 Pergolas are both decorative and useful in a garden space. Designing and building your own pergola allows you to create a style and look that appeals to you. Traditionally, pergolas use a criss-cross technique along the top to add dimension as well as filtered light. There are many options, however, for adding a permanent or temporary covering to your pergola for extra protection from the elements. If you’ve decided a pergola is right for you, here are the step-by-step instructions to build one yourself. The most important step of any DIY project lands in the planning stages. If you want to build a pergola, you will need to make sure that you have the space and the proper infrastructure. A pergola is a solid, heavy structure so it requires a flat and level location for the best support. Since a pergola doesn’t offer complete protection from the sun and rain, you may want to locate your pergola beneath natural protection, such as trees. Also think about which direction the sun will hit the structure. You can choose to lay out the top boards of your pergola front to back or side to side with that knowledge. Planning accordingly is the difference between some protection and none. If your pergola will be near a structure, such as the house, remember that the sides will overhang 18-24 inches from the dimensions of the frame. In other words, leave plenty of room around the structure in your plan. For design, you will need the dimensions of your pergola, measured from one corner post to another on each side. Again, remember to include the overhang in your calculation. As with any project, there are endless options as to the materials you can use. 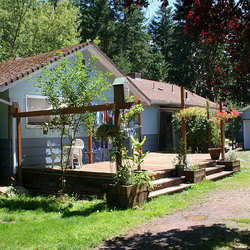 The most popular, partly due to cost, is wood, typically redwood or cedar since they hold up to outdoor elements well. You could, however, use metal, PVC, or even stone. For this tutorial, we will assume you’re building with wood products. Select the type of wood and also consider the overall look of the end result. Do you want blocky 1 x 1 strips along the top or crafted 2 x 6 boards with a curved end? You will also have to decide how far apart you want to space the top beams.The closer together the boards are, the more sun protection they will offer, but also take into account the overall look. Typically, your boards will be spaced between 6-12”. In addition to the top boards, you will want beams for the side supports as well as 4 x 4s or 6 x 6s for the vertical supports. Hardware is another needed supply when building a pergola. Pick up some screws and nails, as well as brackets for mounting beams to one another. If you are mounting the pergola to the house, you will want a metal beam supports for that use. With the planning done and the supplies collected, it’s time to get to work. Use a tractor or hand tools to clear the space for your pergola. Make sure it is level and that all obstacles have been removed. Check with your local utilities company before you begin digging. They will come out and mark the location of all utilities so that you are aware of their location and avoid digging into a power cable or underground pipe. Each vertical post for your pergola will need to be cemented into the ground or set upon a concrete support. Mark your hole locations with stakes and tape or ribbon. Dig your holes at least one-quarter to one-third the height of your vertical corner beams. A 12’ high post would require a 3-4’ depth. Insert your post into the hole and ensure that it is plumb on all side. Mix and pour in concrete and then add temporary cross supports to make sure the posts stay level while the concrete sets. Allow adequate time for it to set and dry completely before adding any cross beams, typically about two days. With the foundational units in place, you can connect them together with cross supports. Use your 2 x 6s to attach each corner to the next. If you are mounting it to the house, you won’t need to connect the two corners attached to the house. You can attach the 2 x 6s to the vertical 4 x 4s with metal joist hangers reinforced with nails or screws. Alternately, you can mount your 2 x 6s to each side of your vertical beam, creating double planked sides and then drive a bolt through all three pieces. Depending on the size of your structure, you may also need to add one or more cross supports across the middle of the structure. With the addition of the cross beams, your structure is solid and stable. Now it’s time to embellish with the decorative top beams. Look at images across the web to decide on your final design. You can use small widths of wood or tall 2 x 6 or even 2 x 8 boards. You can also add two layers of criss-crossing beams for a different effect. While pergolas offer an entrancing visual draw, they also provide a space for climbing vines or an opportunity to add lights to the space. 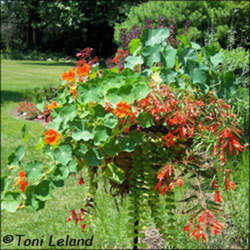 In hot regions, you could add a misting system to the pergola as well. The final look is up to you, from choosing the stain or paint color, to embellishing with cozy touches. Have fun!